The Kenyan government says that it plans to close Dadaab, the world’s largest refugee camp. It had also threatened to close the country’s other major refugee camp, Kakuma, but has subsequently said it won’t. Speaking at the World Humanitarian Summit in Istanbul, Deputy President William Ruto declared that Dadaab will be closed by the end of the year. This move has gained much-needed attention. Kenya continues to host one of the largest refugee populations at a time when international attention has overwhelmingly turned to Europe and the movement of people out of Syria. Despite hosting more than half a million people, the camps’ remote locations and longevity have made them easy to ignore. In addition to the planned camp closure, Kenya’s Department of Refugee Affairs has been shut down. Though the government has threatened to restrict refugees to camps or close the camps altogether several times before, this suggests a worrying escalation. Established in 2006 alongside the country’s Refugee Act, the department worked with the United Nations Refugee Agency to register and assist refugees in Kenya. Who will fill the gap left by this closure is unclear. While not in this case, previous threats have often followed bloody terror attacks such as at the ones at the Westgate Mall in 2013 or Garissa University College in 2015. These have led to refugees being equated with terrorism, and Dadaab being labelled a “nursery for al-Shabaab”. 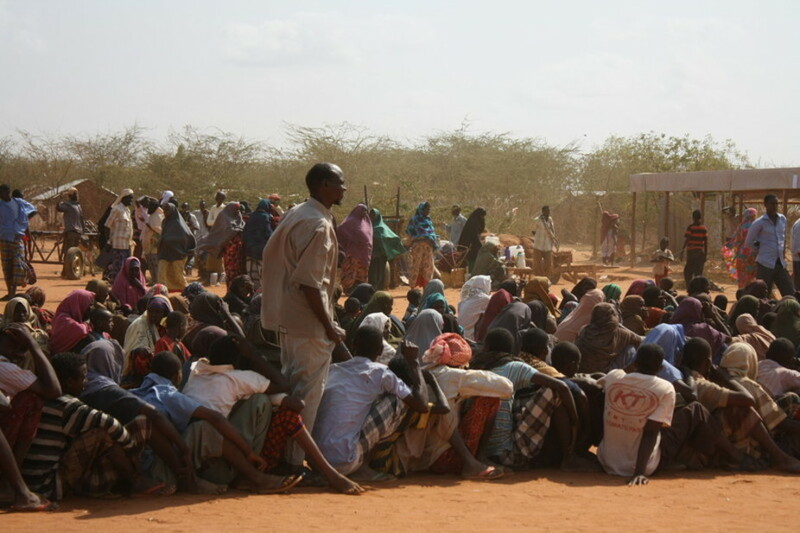 The reality is that the camp highlights the violence that has led many to flee Somalia for the relative safety of Kenya. The perceived danger posed by the movement of refugees serves as a useful tool in populist politics. It can serve as a bargaining chip in negotiating further aid or galvanise fearful citizens. As Donald Trump’s fear mongering over Syrian refugees and anti-migrant rhetoric in South Africa have shown, this is not unique to Kenya. If enacted, the government’s plans would have grave consequences for the hundreds of thousands of refugees living in Kenya. Global resettlement of refugees is already low and unlikely to meet the needs of those being told to now leave Kenya. The closure would result in refugees returning to unsafe countries, moving to other countries in the region that already have their own extensive refugee populations, shifting from Dadaab to the already overpopulated Kakuma or making dangerous journeys to try to reach safety further afield. The move is also in breach of national, regional and international law. The recent start of campaigning for the 2017 Kenyan elections and the announcement concerning refugees is not coincidental. Like the plans to build a border wall with Somalia, the scapegoating of refugees plays out well with parts of the electorate. that, in a world increasingly fearful of the presence of refugees, there is mileage in host countries drawing attention to the burden they carry. Read full article on The Conversation at: Kenya’s threat to close Dadaab camp plays on international refugee fears. Frontex border agency’s annual risk analysis echoes previous warnings that irregular migratory flows could be used by terrorists to enter the EU. The EU’s border force has warned that terrorists may have infiltrated Europe by hiding among asylum seekers, noting that two of the bombers in last November’s Paris attacks arrived on the continent in a smuggling boat from Turkey. Echoing observations made five months ago, the report added: “Two of the terrorists involved in the attacks had previously irregularly entered through Leros and had been registered by the Greek authorities. They presented fraudulent Syrian documents to speed up their registration process. Frontex’s suggestions come weeks after European politicians introduced a stringent new border policy that will see almost all asylum seekers landing on islands such as Leros returned to Turkey. Read Full Article – Border force warns terrorists could enter EU by abusing asylum checks. A woman feeds pigeons at the port of Piraeus near Athens where migrants are camped out. Photograph: Yorgos Karahalis/AP Image Copyright: Guardian and Associated Press. Read Full Article: Greece on brink of chaos as refugees riot over forced return to Turkey. First group of returned migrants were welcomed by Turkish officials in Diki. Image Copyright: BBC. The first boat carrying migrants being deported from Greece has arrived in Turkey as part of an EU plan aimed at easing mass migration to Europe. Scores of migrants boarded ferries on the Greek island of Lesbos and arrived in Dikili, western Turkey. 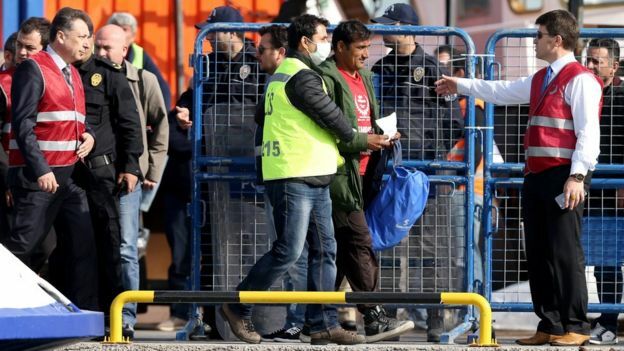 Frontex, the EU’s border agency, told the BBC that most of the 136 people who left Lesbos on Monday were Pakistanis. Meanwhile, the first group of 16 Syrian migrants has arrived in Germany from Turkey, officials say. Under the deal, for each Syrian migrant returned to Turkey, the EU is due to take in another Syrian who has made a legitimate request. However, Greek authorities said the first deportees were those who had not applied for asylum, and included citizens from Bangladesh, Sri Lanka and Morocco. And Turkey’s EU Affairs Minister Volkan Bozkir said there were no Syrians among the first group of migrants sent from Greece. Another ferry carrying migrants to Turkey is also due to leave the Greek island of Chios on Monday. The returns were carried out calmly, despite a small protest at the gate of Lesbos port, where activists shouted ‘No to deportations’ and ‘EU shame on you’, the BBC’s Sarah Rainsford at the scene said. Read Full Article – Migrant crisis: Greece starts deportations to Turkey. 22 March 2016 – The United Nations refugee agency has announced that it is “not a party” to the new provisions agreed between the European Union (EU) and Turkey to stem the large-scale flow of refugees and migrants into Greece and Europe, and that it will align its work to cope with the deal. Till now, the Office of UN High Commissioner for Refugees (UNHCR) has been supporting the authorities in the so-called “hotspots” on the Greek islands, where refugees and migrants were received, assisted, and registered. Under the EU-Turkey deal, which came into effect this past Sunday, these sites have now become detention facilities, and all new “irregular” migrants crossing from Turkey into Greek islands will be returned to Turkey. UNHCR has a policy on opposing mandatory detention. Accordingly, it has suspended some of activities at all closed centres on the islands, including provision of transport to and from these sites. Read Full Article: UN News Centre – UN rights chief concerned over ‘collective expulsion’ of migrants after EU-Turkey deal. Read Full Article: UN News Centre – UN refugee agency redefines role in Greece as EU-Turkey deal comes into effect.